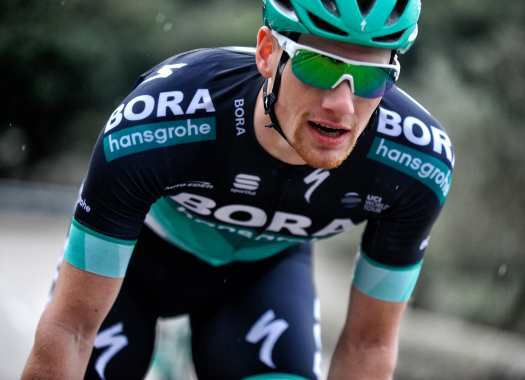 Sam Bennett (Bora-hansgrohe) was the fastest at the final sprint of the seventh stage at the Giro d'Italia. The rider crossed the finish line just ahead of Elia Viviani. The seventh day of racing in the Italian race took the riders from Pizzo to Praia a Mare over a mostly flat course. At the eighth kilometre of the stage, Davide Ballerini (Androni-Giocattoli), Maxim Belkov (Katusha-Alpecin) and Markel Irizar (Trek-Segafredo), created the escape of the day and took an advantage of more than four minutes over the pack. In the peloton, teams with sprinters took charge of controlling the pace. At around 12 kilometres from the end, the peloton caught the escapees and there were some attempts to attack but the speed in the bunch made it impossible for anyone to get away. Riders like Danny van Poppel (LottoNL-Jumbo), Niccolo Bonifazion (Bahrain-Merida), Elia Viviani (Quick-Step Floors) and Sam Bennett (Bora-hansgrohe) fought in the final sprint and though it looked like a new win for the Italian, Bennett surpassed him in the last metres and took the victory. Simon Yates keeps the Pink Jersey for another day.